Pujyasri Chandrasekharendra Sarasvati Swami, the illustrious 68th Acharya of the Kanchi Sankaracharya Matha illuminated Bharata-Desa during the major part of the twentieth century, He adorned the Kanchi Sankara Matha for about 87 years. To the vast mass of his devotees, he was Divinity in Flesh and Blood. Many foreign scholars and thinkers have paid eulogistic tributes to his unsurpassed knowledge while some have sought his advice to get spiritually enlightened. Only occasionally, or rather once in centuries, great men are born on this earth. The famous Indian writer and novelist, K.S. 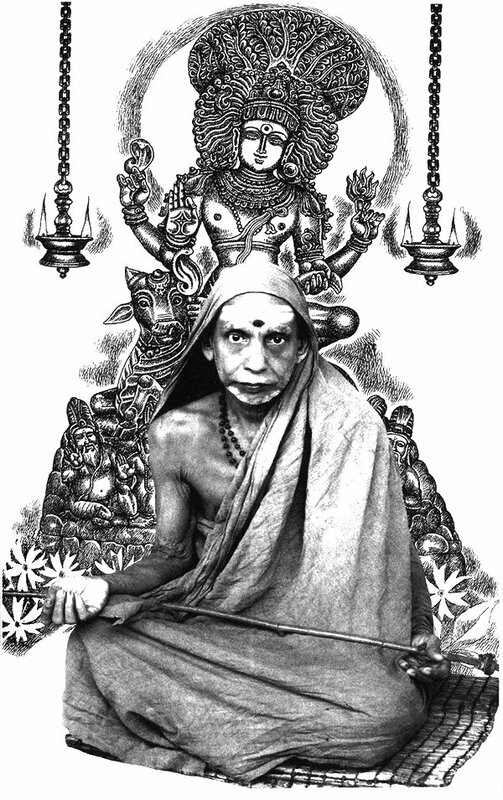 Venkatramani, once observed, “Three Great Seers of our time were all living in a small but hallowed piece of the earth, in the heartland of the Tamil region.” Of course, the writer’s reference is to the illustrious Acharya, the 68th head of the Kanchi Sankara Math, Sankara Math, Sri Ramana Maharishi of Tiruvannamalai and Sri Aurobindo who spent a number of years at Pondichery. In fact, these three great seers had no Guru (Preceptor) to guide them, nor had they any sankalpa (set purpose). The Great Achary of kanchi, besides having been a prophet, has had the stupendous responsibility of administering a great monastic institution with varied activities to which lakhs of devotees own allegiance. Sri Chandrasekharendra Sarasvati Swami was initiated into the ascetic order and installed as the 68th Acharya of the Kanchi Sankaracharya Math on the 13th of February, 1907, when he barely thirteen years of age. To produce a succinct biography of the Maha Swami of Kanchi is not quite an easy task, since the Acharya has been ontours for a pretty large number of years. The first regular biographical account of the Sage is the one written in Tamil by the late Sambamurthi Sastry, under the title Jagadguru-Divya-Charitram. The first edition of this work was published in 1957 and he second in 1979. This copious biography has perhaps been the base for subsequent biographical sketches. ‘The Grace of Sankara Incarnate’ and ‘The Sage of kanch’, by Dr. T.M.P. Mahadevan, are praise- worthy and brief biographical sketches. 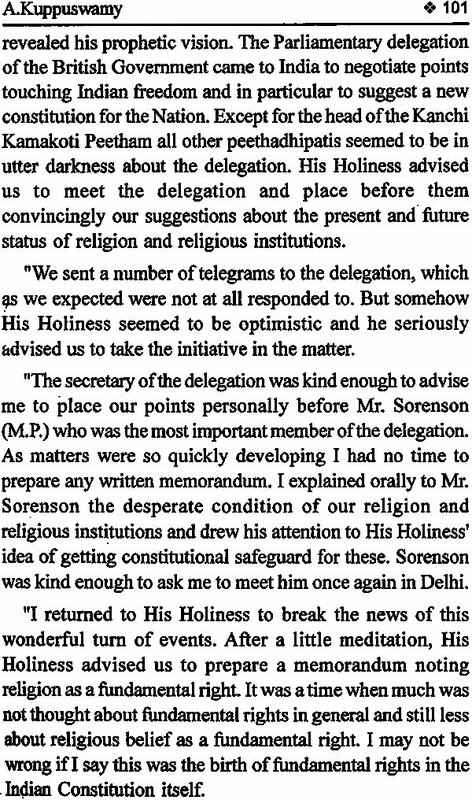 ‘Benign Beacon’ written by a devotee and published by Sri Kamakshi Seva Samithi, Bombay, in 1984, is a comparatively short sketch, though rich with thrilling experiences and interesting episodes. It remains to be said that none of the above mentioned works is complete. An article with the title, ‘The Evening of an Epic Life’ in the ‘International Birth Centenary Souvenir’, published by the Association for Hindu Dharma, (Madras), is a good attempt in completing the life-story of the Sage of Kanchi. 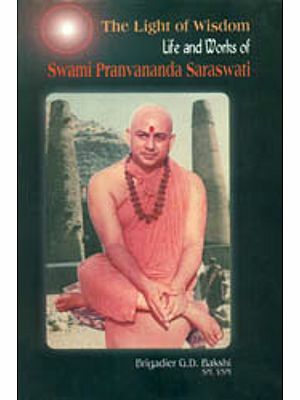 The present work begins with a poen in Sanskrit and a short article on the greatness of the Maha Sawami, (already published by Pujyasri Acharya Jayenfra Sarasvati Swami and followed by a poen of 10 verses (in Sanskrit) by Pujyasri Sankara Vijayendra Sarasvati Swami, (already published). The life-story of the Sage of Kanchi, spreading over well nigh a century, is narrated briefly in the succeeding pages of this work for which originality is not claimed. All available, relevant matter has been freely drawn, especially from ‘Jagadguru-Divya-Charitram’, Dr. T.M.P. Mahadevan’s books and from souvenirs such as the three volumes of ‘A Hundred Years of Light’, and The International Birth Centenary Souvenir, etc. Our profound thanks are due to the publishers of all the above said publications. 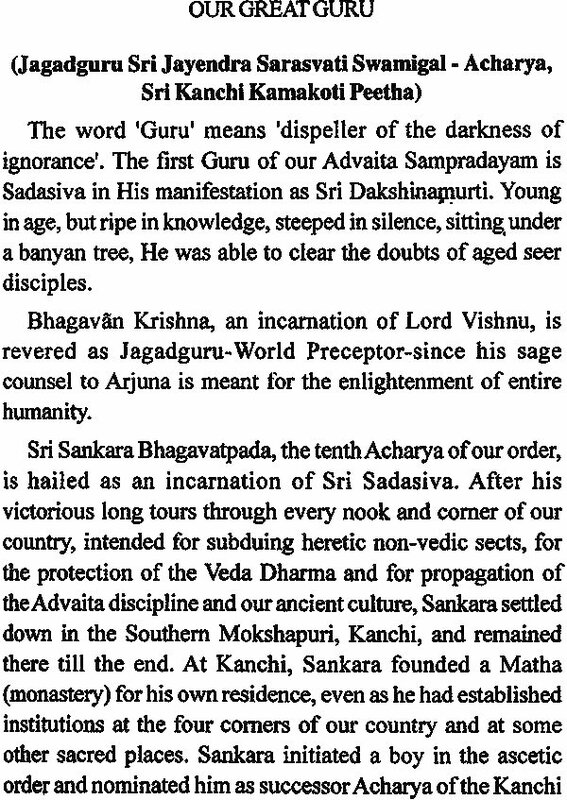 The present concise biography of the world-renowned Sage has been brought out under the direction and blessing of His Holiness Jagadguru Sri Jayendra Sarasvati Swami and of His Holiness Sri Sankara Vijayendra Sarasvati Swami of the Kanchi Sankaracharya Math. My pranams at the lotus feet of the two venerable Acharyas. Our grateful thanks are due to Sri Kamakshi Seva Samithi of Bombay and the Acharya Bhakta Jana Kainkarya Sabha, Madras, for rendering financial assistance for the first edition. Our thanks to the printers and other friends who have been helpful in this task. Sri Sankara Bhagavatpadacharya is one of the greatest philosophers and spiritual preceptors of the world. He has shone as a discerning as a consummate commentator and as a poet of eminence. The miraculous achievements of his short span of life, stand testimony to his being a superhuman personality. He has been devoutly regarded as a partial incarnation of God Siva by sages and scholars of the long centuries after Sankara’s advent. Modern scholars and thinkers of many a country have eulogised the greatness of Sankara. The mass of literature, by way of commentaries, devotional hymns, Mantra-sastra texts, etc., left over to posterity by the great Preceptor, indicates his intellectual greatness. His long and wide travels through the length breadth of Bharat, have been effectively instrumental in dissolving several heretic sects and in integrating the nation. His preachings have dispelled the darkness of ignorance, prevalent in the minds of men. Thereby Sankara has been the harbinger of peace of mind to mankind. 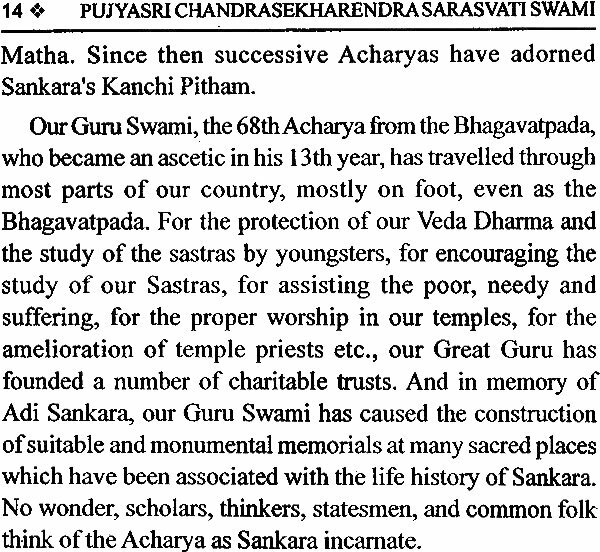 For safeguarding the Veda-Dharma and restoring it to its pristine glory and for propagating the Advaita discipline, the Great Acharya established monastic institutions at many of the sacred and important places of the country, that he had visited during his digvijaya-yatra. He settled down at Kancheepuram at the end of his peregrinations and spent the evening years of his life in the Matha that he founded at Kanchi for his own residence. He initiated a very young boy into the ascetic order, nominated him as his successor in his Kanchi Matha. and placed him under the care of Sri Suresvara, the most aged and the most erudite of His disciples. After the Great Adi Sankara, the Kanchi Sankara Math has been adorned by a long line of Acharyas distinguished for their learning, discipline and penance. Among the Acharyas of the Medieval age, the name of Abhinava Sankara stands preeminents. He was so great that he was confounded with the timings and deeds of the Great Adi Sankara, He was the disciple of Sri Vidyaghana (37th Acharya). 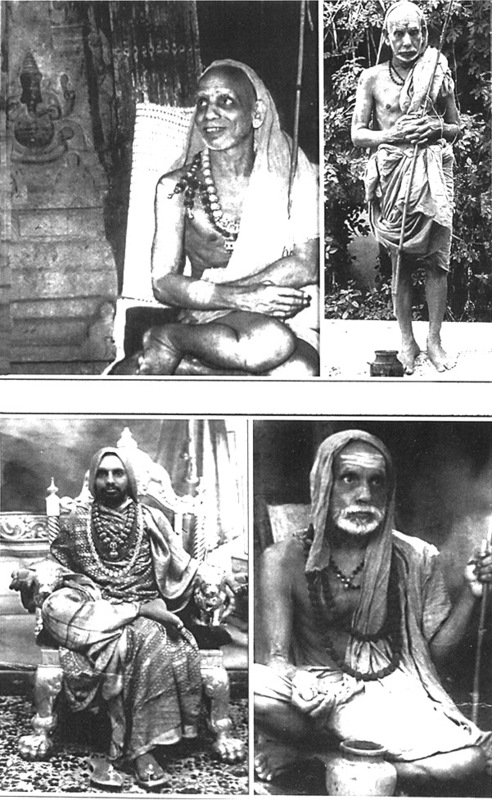 Abhinava Sankara made extensive tours in North India. He defeated (in debate) the famous Vakpati Bhatta, a reputed scholar of the court of the king of Kashmir. He ascended the Sarvjna great scholars. Another famous Acharya of the Kanchi peetha was the 47th- Sri Chandracuda Sarasvati (1098-1166 A.D.) He travelled widely all over the country. This Acharya was held in great esteem by erudite scholars such as Manka, author of Srikantha Charita, by Krishna Misra, author of “Prabhoda Chandrodaya” and by Jayadeva, author of Prasanna Raghava’, ‘Chandraaloka’ and ‘Bhakti Kalpa- Latika’. Jayasimha, ruler of Kashmir, was a staunch devotee of this Acharya. The 51st preceptor, Sri Vidyateertha (1247-1297) was an erudite scholar. Saayana, commentator of the Vedas, Madhavacharya (Vidyaranya after becoming an ascetic), Bharati Krishna Teertha (of Sringeri Math), Vedanta Desika and Sankarananda of Kanchi Sankara Math were prominent among vidya Teertha’s disciples. Sri Sankarananda, the next Acharya, has written commentaries (called Deepikas) on four of the principal Upanishads and also a gloss on the Bhagavat Geeta. Sri Vyasachala Mahadevendra Sarasvati the 54th preceptor wrote a biography of Adi Sankara. (This work has been published by the Government Oriental Manuscripts Library at Madras). Sri Paramasivendra Sarasvati (57th Acharya) was author of Dahara-Vidya-Prakasika’ and commentary on Siva Geeta. 58th Acharya of the Peetha was Atma Bodhendra, also as Visvadhikendra, went on a tour to Varanasi where he stayed for some years. Sri Bhagavannama Bodhendra, disciple and successor of Sri Atma Bodha, propagated the path of devotion as a means of salvation. He wrote two works on the efficacy of chanting the names of Bhagavan, viz., Namamrta Rasayana and Namamrta Rasodaya. 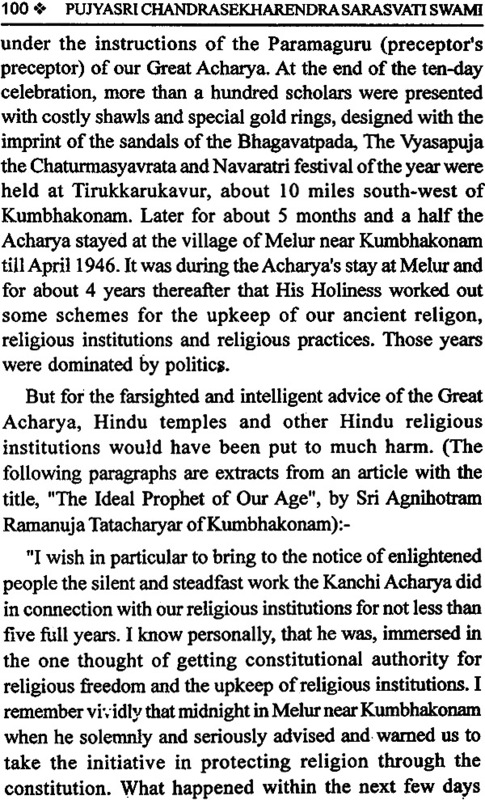 Among the later Acharyas, Sri Chandrasekharendra (1746-1783 A.D.), the 62nd Acharya of kanchi, had to migrate to the southern districts of the Tamil region, due to the uncertain political atmosphere that prevailed in the area around Kancheepuram, during the period of the Carnatic Wars. 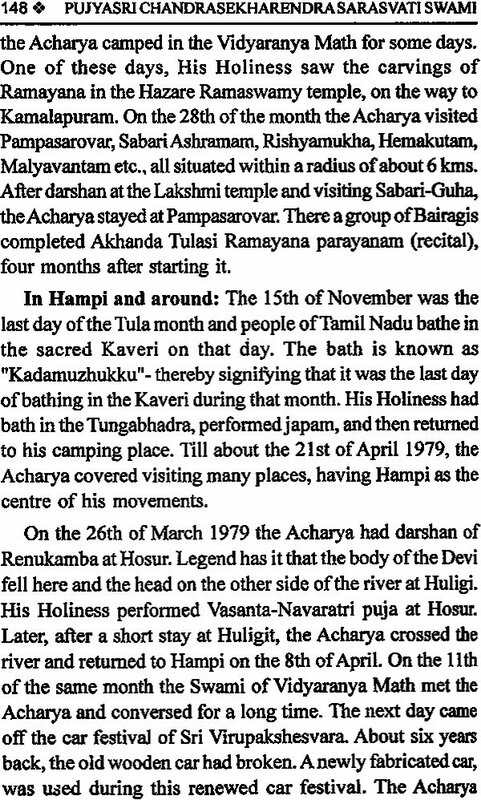 After prolonged camps at Ramanathapuram, Trivandrum, Pudukkotai etc., this Acharya stayed for long at Udayarpalayam on the request of the Zamindar of Udayarpalayam. Later in about 1760 A.D., the Acharya moved to Thanjavur complying with the request of Raja Pratapa Simha, ruler of the Mahrata Kingdom of Thanjavur. About a year later, this Acharya began to reside in the new Matha built on the bank of the river Kaveri, at Kumbhakonam, by Dabir Panth, Minister of Thanjavur, under the directions of Raja Pratapa Simha. The63rd Acharya was a great yogi. The next preceptor Sri Chandrasekharendra Sarasvati was an adept in Mantra-sastra. He got the temple of Sri Kamakshi at Kanchi, repaired and performed Kumbhabhishekam to it in 1840 A.D. He also caused reparing of the Tatankas (ear-ornaments) of Goddess Sri Akilandesvari, in the Jambunatha temple at Tiruvanaikoil (near Tiruchirapalli) and reconsecrated them on the ears of the Devi, in 1848 A.D. It is to be noted that the three Acharyas (62nd, 63rd and 64th ) attained eternal bliss Kumbhakonam and that Brindavanas (place where mortal remains of an ascetic are intered) are in the backyard of the Sankara Math at Kumbhakonam. The 65th Acharya of Kanchi Sankara Math was Sri Mahadevendra Sarasvati (1851-1891 AD.) who toured widely throughout South India. He attained siddhi at the village of Elayattankudi, in the Ramanathapuram district of Tamil Nadu. The Brindavans of the next two Acharyas, are at Kalavai about 20 miles away from Kancheepuram. The 68th Acharya of Kanchi, the world-renowned Sri Chandrasekharendra Sarasvati Swami, became pontiff in 1907, when he was barely thirteen years of age. 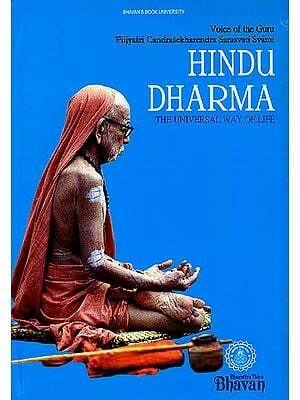 He shone as Acharya for nearly 87 years. His successor, on the Kanchi seat of the Bhagavatpada, is Sri Jayenrdra Sarasvati Swami who was initiated and nominated as successor in 1954. 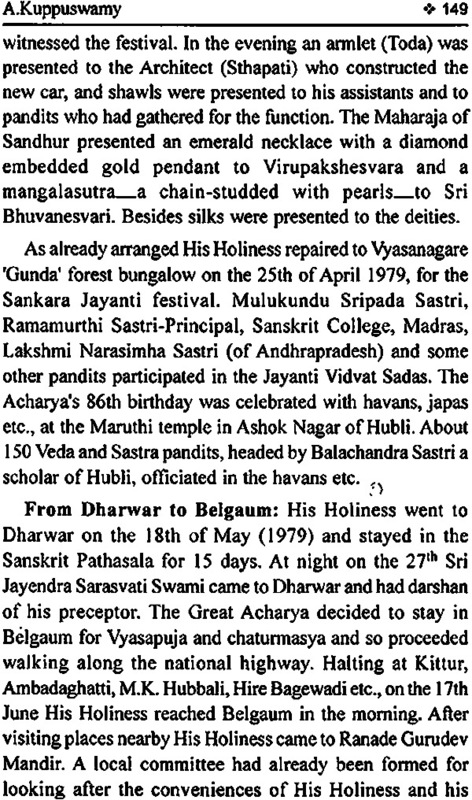 In 1983, this 69th Preceptor gave sanyasa- deeksha to a boy in his early teens, gave him the name Sankara Vijayendra Sarasvati and nominated him as successor Acharya. The 69th Acharya and his disciple Acharya are adorning the kanchi Sankara Matha at present.